Hello internet denizens. How are you today? I am lazy. And this is a good thing. I need to lose the piano (it might be down to a harpsichord) I've been carrying around for the last few years. Add to this the fact that I am quite lazy in many regards. My understanding is that being lazy means that you sit around and don't do anything. Thus I should be good at NOT doing things because I have a whole boat load of practice being lazy. Also, scientific research seems to show, that NOT eating gratuitous amounts of food will lead to you NOT having to ask for an extender belt on the airplane. 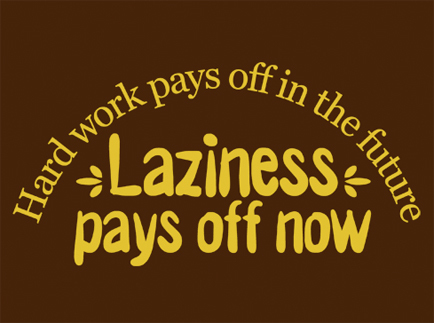 (mmmm tasty double negatives...) The problem is people don't take their laziness far enough. They are lazy enough to sit on the couch and watch a 24 hour Pawn Stars marathon, but THEN (horror of horrors) they decide to do something like reaching over to the built in sofa fridge, pull out a mound of cheese-covered side pork, and start the very strenuous activity of noshing. If they were really taking their laziness to the next level, they wouldn't think of making the effort of lifting their arm and grabbing something, and then raising a utensil (fingers, dive into the bowl?) to their mouth repeatedly. Thus emerges the equation - If L then D, which causes NE. If you are truly lazy then you won't do things, like eat gratuitous amounts of food, which causes No Extender! Yeah! For the first time, not doing things, will lend themselves to my benefit! And to the lifespan of my belt! Here's to not doing a bunch of things.